LG's battle to keep your food as fresh as possible has landed at IFA 2015 in the shape of a glut of new refrigerators. The company has its sights on Europe's eco-conscious consumers with four new models that bring a number of innovations including a second door-in-door compartment and technology that drives energy usage down by over a quarter. Dual door-in-door tech ensures that food is kept fresher for longer and means organisation is kept at a high level. The right hand compartment can be accessed from the outside of the fridge by pressing a button, which in turn saves on energy costs that opening the entire fridge causes. The left hand one, meanwhile, has an easy open handle that is hidden at the bottom of the door and it makes this ideal for storing the essentials. All this reduces the cold air escaping by 47%. 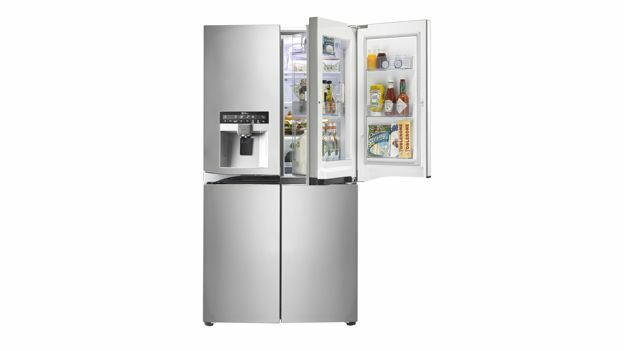 Driving the fridges is a new inverter linear compressor that uses a straight piston drive meaning less internal friction and LG models that have used the technology in the past have been 32% more energy efficient and 25% quieter than non-inverters. That isn't everything either. Certain models come with smart diagnosis, which contacts the call centre to solve any problems that may be encountered and eliminates the need for a house visit by an engineer. LG's new models take the form of the High Energy Efficient Bottom-Freezer, Premium Contour Glass Bottom-Freezer, Dual Door-in-Door model, and the Luxurious Modern Style Multi-Door. All four benefit from the inverter linear compressor and a 10-year warranty yet the dual door-in-door is only present in one of the fridges. There is currently no word on a release date for the fridges and the only way to see them is to rock up to LG's IFA booth.